Disk Management of Windows operating system is a simple yet effective tool to initiate, create, delete, manage and format disk partitions or volumes. Disk Management can be accessed via Control Panel -> System and Security -> Administrative Tools -> Computer Management -> Disk Management under Storage tree, or directly via diskmgmt.msc command. However, Disk Management is limited in its ability, especially when dealing with hidden, system, reserved, recovery and system partitions that are protected by Windows operating system. Most if not all OEM desktop computers or notebook PCs from Dell, HP, Lenovo, Acer, ASUS, Samsung, Alienware, Sony, Fujitsu, Toshiba and etc. comes with special OEM, EISA or EFI partition either in FAT or NTFS file system that contains boot loaders, system recovery utility to rollback to original default factory settings, diagnostic tools, device driver files, system utility programs and system configuration files that are used by the firmware at boot time or to be run before an operating system is booted, and/or for other purposes. These special partitions, which can be hidden from view, or without any drive letter assigned, can have a size of from few gigabytes to 10 GB or more. As most of these disk partitions is protected and locked by the operating systems to prevent and avoid accidental deletion of these partitions, they cannot be deleted by using Disk Management snap-in. The partition cannot be merged into any other existing partition either. 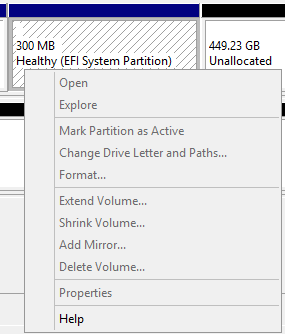 When right clicking on these protected partitions, the menu is greyed out and disable, or simply cut-shorted with most options not available. Some users reported that even advanced third-party disk management tool such as Acronis Disk Director and Partition Magic cannot manipulate, change, remove and delete the partition either under Windows desktop. Some users may not want to keep the EISA, recovery, EFI system and other protected and hidden partitions that come pre-configured on the computer. By deleting these partitions, it’s possible to free up a few GBs of hard disk storage space. Follow the steps below to use Diskpart, a text-mode command line interpreter based on scripts that manages hard disk, partition and volume in Windows, to delete any unwanted partition that is undeletable under Disk Management tool. If the partition that you want to remove is a recovery partition, it’s recommended to check with manufacturer if the OEM provides any guide, procedure or utility to remove and partition and recovery partition, such as Lenovo ThinkPad. Normally, most OEM provides a GUI-based application that asks you to create a recovery DVD or USB flash drive before allowing you to discard that recovery partition. Some partition, especially EFI System Partition (ESP) contains boot loader which may cause your system unbootable if deleted. So proceed with care. If you don’t see the disk you want, enter rescan command and press Enter key to re-scan all partitions, volumes and drives available. Remember to specify the correct number of disk to manage (in example above, change number 2 to appropriate number corresponding to the number as listed in “list disk” command). Normally, with just 1 hard disk, it will be disk 0. Change number of partition (1 in example above) to actual number reflecting the partition that you want to delete. Be careful with the number of this partition, as wrong number may get data wipes off accidentally. Once the partition has been deleted, exit from Diskpart, and now users can use the much familiar and much easier Disk Management tool to manipulate the freed unallocated partition. Users can create a new volume (partition) with this space, or simply merge it to existing partition by extending the size of the existing partition.